Skeemo is a simple puzzle game. To win you have to line up 4 or more pieces of the same color horizontally, diagonally, or vertically. Once cool feature is that you can click the ‘Save Game’ button and return anytime later to resume your game. To play, Tap a piece, then tap an available location (marked with a white spot) where you would like it to move. If you do not score a row of four or more of the same color as defined above, 3 more pieces will appear randomly. 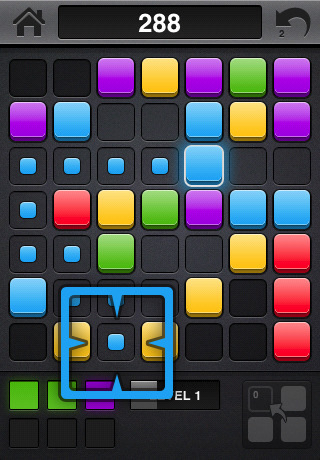 Keep moving pieces around and attempt to create rows until there is no room left, then save your high score! Every 500 points you score, another piece will be added to the random generation process. AppSafari review of skeemo was written by Joe Seifi on October 25th, 2007 and categorized under App Store, Fun, Games, Puzzler. Page viewed 7124 times, 1 so far today. Need help on using these apps? Please read the Help Page.